There are currently two tubes of cleanser in my shower. Both of them come from US-based brands working with South Korean manufacturers; both of them feature green tea as a star ingredient. Both are green gels packaged in tall, thin squeeze tubes. And, standing side by side on an overcrowded shelf, Krave Beauty Matcha Hemp Hydrating Cleanser and Whamisa by Glow Recipe Green Tea Foaming Cleansing Gel both are overdue for a review. Much like my left and right eyebrows, these cleansers look like sisters, but not twins. The products featured in this post were originally provided by the brands. This post contains one affiliate link, which enables me to make a small commission on purchases made using the link. The affiliate link is marked with an asterisk(*). Funny story. About a year and a half ago, at the first KCON I attended, I was at a dinner with the creators of both these products: Christine Chang and Sarah Lee, founders of online K-beauty store and skincare brand Glow Recipe, and Liah Yoo, the skincare and makeup YouTuber behind the recently launched Krave Beauty brand. If life were a movie, there would be some serious dramatic and metaphorical significance to that dinner, or at least some heavy-handed foreshadowing. Life isn’t a movie, though. No narrative devices here. 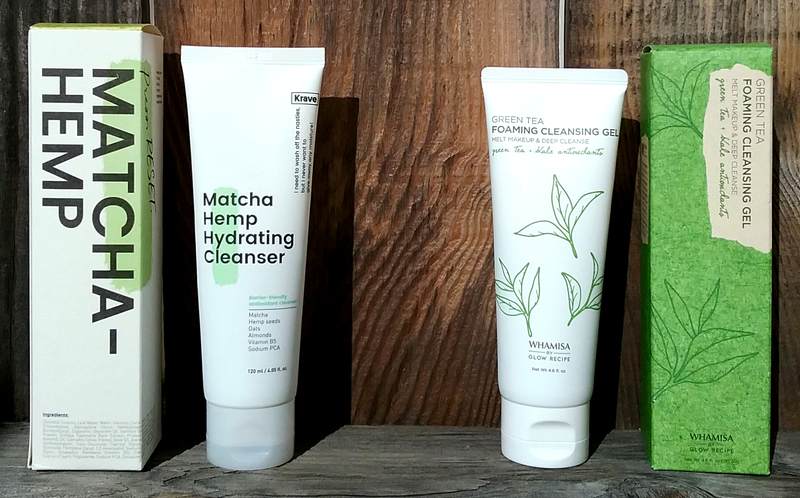 Just green tea-based cleansers. Purpose: Krave Beauty Matcha Hemp Hydrating Cleanser and Whamisa by Glow Recipe Green Tea Foaming Cleansing Gel are both water-soluble facial cleansers that claim to provide antioxidants and thoroughly cleanse skin without stripping or drying it out. Best suited for: The Krave cleanser is best suited for normal to combo-dry or dry skin. The Glow Recipe cleanser is best suited for normal to combo-oily or oily skin. Do not use if: You are sensitive to glycols (in the Krave Beauty cleanser), fragrant essential oils (in the Whamisa by Glow Recipe cleanser), or anything else in your chosen cleanser’s ingredients list. When and how to use: Use as your primary cleanser in the morning and/or after your cleansing oil or balm as the second step in your double cleanse at night. Wet face and hands. Work cleanser into a lather in hands or apply directly to face as desired. Massage gently. Rinse thoroughly. Krave Beauty’s cleanser isn’t as heavy-handed with the greenery, but the brand takes a similar marketing approach, playing up the antioxidants in its titular ingredients, matcha (green tea) and hemp. If these were leave-on skincare products, I’d be much more excited about the Whamisa by Glow Recipe cleanser’s extract-heavy formulation than I am. But these are wash-off products, and that means that realistically, most of the possibly beneficial ingredients in them are going to wash off. If they didn’t wash off, the cleansers wouldn’t be very good. For cleansers, I look instead at the cleansing agents they use. Neither of these brands uses harsh sulfates in their cleanser. Both rely on gentler surfactants to clean skin. Krave Beauty Matcha Hemp Hydrating Cleanser’s main surfactant is coco betaine, while Whamisa by Glow Recipe Green Tea Foaming Cleansing Gel’s main surfactant is coco glucoside. Both are milder than SLS or SLES. Comparing the cleansers at this point, it’s a wash (pun intended). Looking more closely, however, you can spot some fragrant essential oils in the Glow Recipe cleanser, while the Krave cleanser specifies that it’s essential oil-free. While I personally don’t have problems with fragrant oils, they are known irritants for a number of people. In addition, Krave labels its cleanser as vegan and cruelty-free. I find those qualities more meaningful than Whamisa by Glow Recipe’s avoidance of parabens and mineral oil, since I agree with Chel from Holy Snails that parabens in skincare are fine. I don’t have a problem with mineral oil either. I award the ingredients point to Krave Beauty. Coming out with an early lead. One of the best things I ever did for my skin was to start paying attention to the pH of my cleansers. I won’t go into the subject much here–you can read my cleanser pH primer and get links to lots of more extensive discussion here–but I will say that extended use of any cleanser with a pH higher than 7 always leaves my skin tight, dry, and irritated to the point of redness (or beyond). Meanwhile, although I can find plenty of reasons to dislike a low-pH cleanser, stripped and sensitized skin won’t be among them. If your skin doesn’t respond poorly to alkaline cleansers, I envy you. You can have my rejected high-pH products. I’ll be over here clutching my pH strips and looking for face washes with a pH of 7 or below. I used my trusty Macherey-Nagel four-color pH testing strips* to check the pH of the Krave and Whamisa by Glow Recipe cleansers. 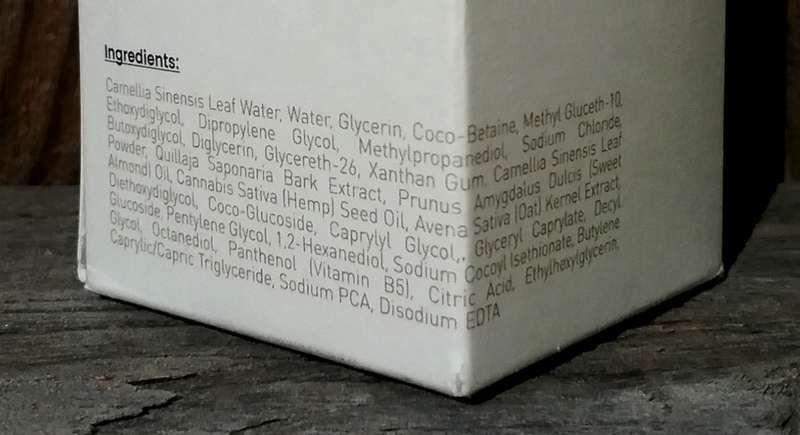 Krave Beauty prints the pH of the Matcha Hemp Hydrating Cleanser right on the box, listing it as between 5.0 and 6.0. Slight variances between batches can result in slightly different pH readings from tube to tube, and it’s refreshingly honest of the brand to admit to that possibility. My tube tested at about a 6. Pretty decent and in line with the product’s stated aim of being gentle to the skin barrier. Sometimes I’m tempted to take my pH strips with me when I think I might encounter a cleanser in the wild. 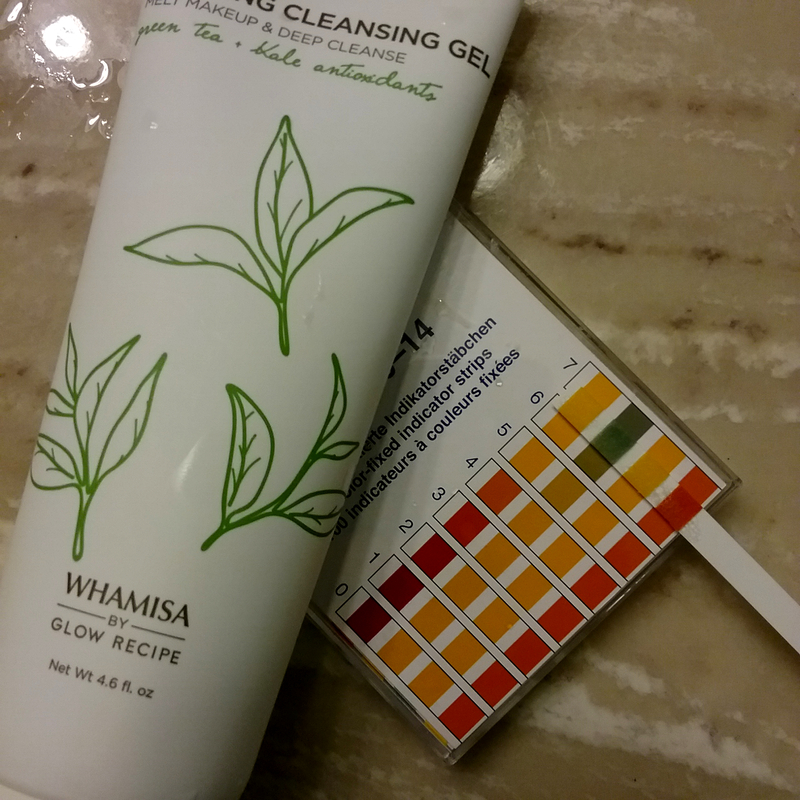 Whamisa by Glow Recipe Green Tea Foaming Cleansing Gel tests at a 7, which exactly matches the number Glow Recipe told me when I asked them about the pH of the cleanser. Some pH purists find 7 too high. My skin is fine with it, but 7 is the maximum for me, so this cleanser is right on the edge of acceptability, pH-wise. I really love these pH strips. The lower pH here means the point goes, once again, to Krave. Now we’re getting down to it. Krave Beauty Matcha Hemp Hydrating Cleanser and Whamisa by Glow Recipe Green Tea Foaming Cleansing Gel might sound pretty similar in theory, but in practice, they’re surprisingly different. The Krave cleanser comes out of the tube a thick, jiggly, noticeably lumpy jelly. It holds its jellylike consistency stubbornly even when mixed with water, producing an unusual slippy feeling when massaged over skin. This cleanser feels like rubbing lightly lathered lube all over your face, and I mean that in the best way possible. There’s zero drag, zero pull on skin. The cleanser creates a glide that helps minimize any irritation that the act of cleansing might cause. Yes, it kind of looks like snot, and no one in my house cares for the musty, earthy scent of it, but it feels like liquid silk. Whamisa by Glow Recipe’s Green Tea Foaming Cleansing Gel has a standard gel consistency and mixes with water more easily into a moderate lather. One interesting thing to note about this cleanser is that it contains a bunch of powdered green tea, which can settle unevenly in the product. Sometimes you’ll get a lump so full of the powdered bits that it ends up providing some minor exfoliation on top of the usual cleansing. Other times, you’ll get no powder at all. The lather moves easily over skin, though without the Krave cleanser’s Astroglidey feel. This cleanser has a subtle, fresh green scent. Since Krave’s cleanser feels great but smells unpleasant to me, while Glow Recipe’s cleanser feels fine and smells fine, I score them both the same here. Finally, let’s get down to cleansing abilities. Krave Beauty’s cleanser is, as advertised, gentle and barrier-friendly. After consistent, twice-daily use over the course of several weeks, my skin barrier feels just as healthy as it did when I started. While I wouldn’t say this cleanser actively hydrates my skin, I will say that it leaves my skin feeling as soft and supple as possible after washing: it allows my skin to retain its own moisture, a good quality in a cleanser. I do find, however, that when I’ve worn heavier skincare, sunscreen, or makeup than usual, the Krave Beauty cleanser can fall short of getting my skin completely clean. 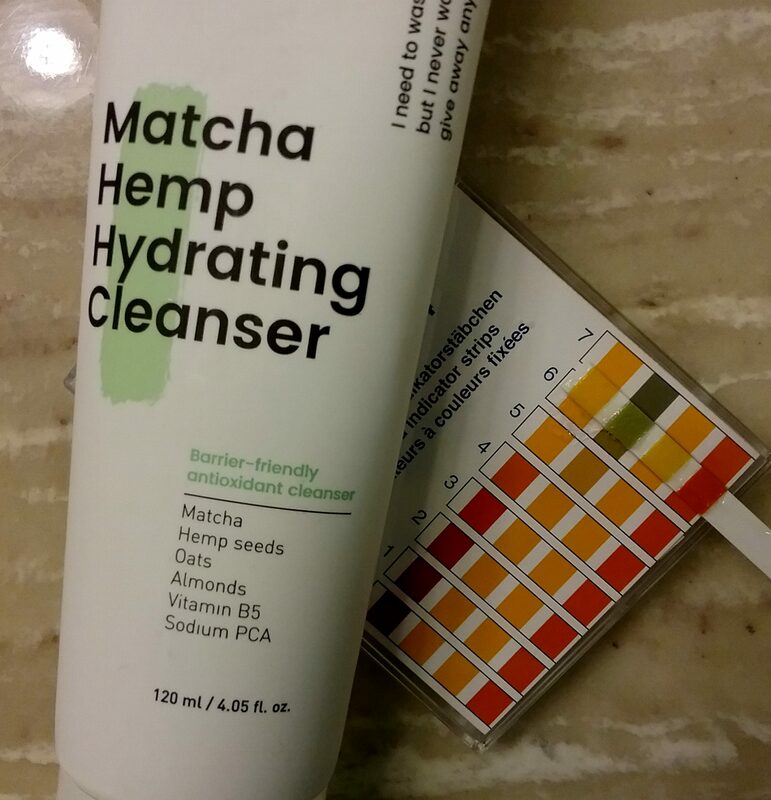 I’ve felt a slight residue of product on my skin or discovered a little on a cotton pad of toner after use, as if the Matcha Hemp Hydrating Cleanser isn’t fully equipped to tackle long-wearing cosmetics (even after cleansing oil) or extra thick nighttime moisturizers and sleeping packs. As expected for a skincare line targeted at oilier complexions, Whamisa by Glow Recipe Green Tea Foaming Cleansing Gel cleanses more thoroughly. I never notice any leftover gunk on my skin after using this cleanser, no matter how intense my sunscreen and makeup were throughout the day or my occlusive layer was the night before. The trade-off in gentleness isn’t major, either. While my skin definitely feels more deeply cleansed and slightly less bouncy after using this product than it does when I use Krave’s, it never feels outright stripped or sensitized, even after going through an entire tube and a half of product. There’s a reason I rushed out to buy myself a second tube when my first, PR-provided one ran low. Since a cleanser’s first duty is to cleanse, I give the cleansing point to the Whamisa by Glow Recipe cleanser. This is also the cleanser that Lord Fiddy and the young master prefer. Conclusion: Neither of these cleansers is a holy grail for me. They lack that spectacularness that a cleanser like Sulwhasoo’s Snowise cleanser possesses. But they also lack the spectacular price point of the Sulwhasoo cleanser, and both of these green tea cleansers have plenty of good points, which is why both of them get to stay in my shower. 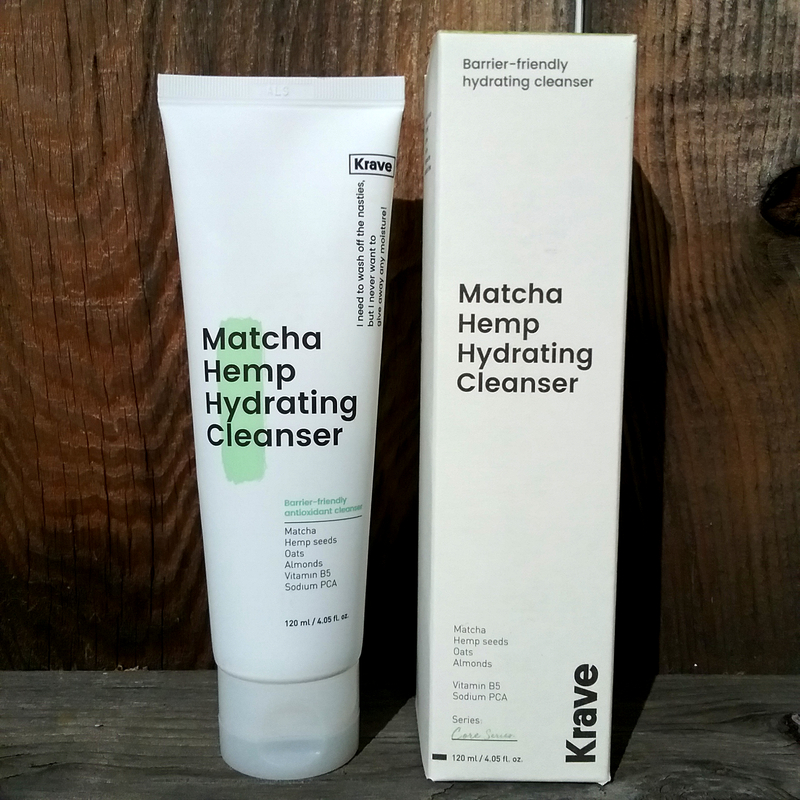 Krave Beauty’s Matcha Hemp Hydrating Cleanser provides a more pleasurable experience overall and lives up to its promise of being gentle to skin. I’d be comfortable recommending it even for very dry or sensitive skin. 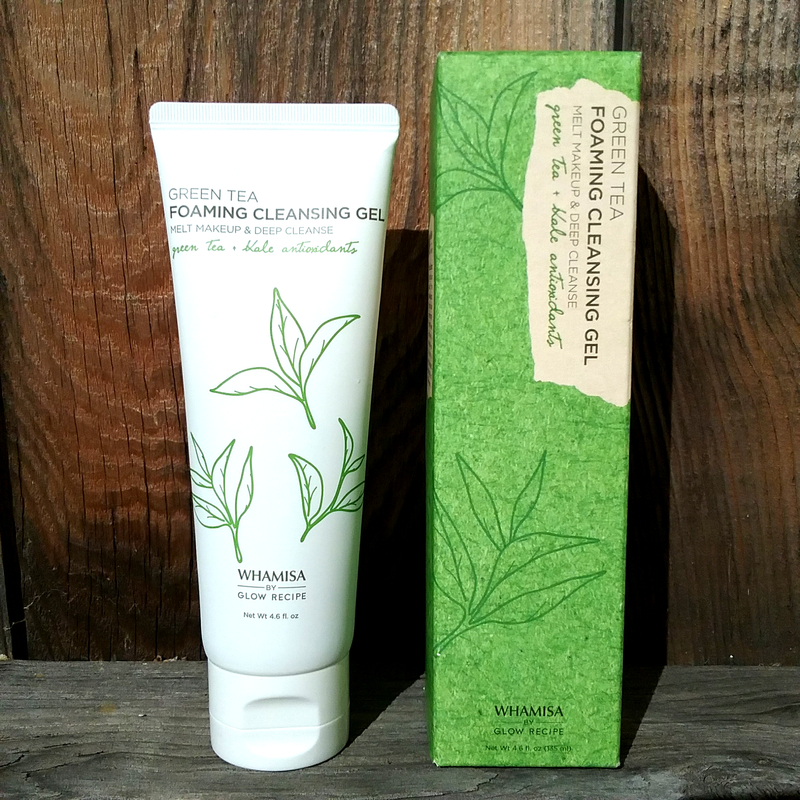 When I need thorough cleansing, however, I reach for Whamisa by Glow Recipe Green Tea Foaming Cleansing Gel, and my skin doesn’t squeak or suffer because of it. Which one is right for you? Ultimately, it depends on whether you need a little extra gentleness or a little extra cleansing power. If I had to choose one to repurchase right now, then despite my preference for the ingredients, pH, and skinfeel of Krave’s cleanser, I’d choose Whamisa by Glow Recipe’s due to its greater practicality. How does Krave Beauty Matcha Hemp Hydrating Cleanser compare to Glossier Milky Jelly Cleanser? I like Krave’s cleanser much better than Glossier’s. The intense slip of Krave’s cleanser makes using it much more comfortable, and I prefer the earthy smell of the Krave cleanser to the oddly plasticky rose scent of Glossier’s. It leaves my skin just as soft and rinses off more easily. Where can I buy Krave Beauty Matcha Hemp Hydrating Cleanser or Whamisa by Glow Recipe Green Tea Foaming Cleansing Gel? You can find Krave Beauty Matcha Hemp Hydrating Cleanser at the Krave Beauty website. Likewise, you can find Whamisa by Glow Recipe Green Tea Foaming Cleansing Gel at Glow Recipe. Do you use an AHA? I haven’t tried it but have heard quite a bit about Indian skincare! Can you tell me how it smells? I must say I can’t tolerate the smell of neem oil on its own, so I’m a little nervous to see it in the name of a product. Hi Camila! Do you have any sense of what particular ingredients are irritating your skin? There is a very new brand that I’ll be introducing and reviewing soon (you can see one of their products in a couple of my Instagram posts) called Eqqualberry, which was developed particularly for dry and very sensitive skin and to be usable by as many people as possible–I suggest you keep an eye out for them. I’m looking at the ingredients for their toner and don’t see any of your triggers nor any other common ones! Hada Labo (Japanese) is another brand you should check out which has quite simple and mild ingredients, as the other commenter mentioned. And don’t worry about trying to assemble a “full blown” K-beauty routine–it should all depend on your skin and be added one item at a time, according to your own skin’s needs. Take it slow for the best results! Love how thoroughly you break everything down! I’ve yet to find my HG cleanser but the Hada Labo Super HA Foam comes really close. thank you for the review. how is the matcha cleanser compared to the cosrx good morning cleanser? More gentle, less thorough, and smells like matcha(?) instead of tea tree! I have cystic acne over my forehead and comedones on cheeks. Could you suggest me a product to heal my Indian skin. Hi, can you tell me what products you use in your skincare routine currently? I use cleanser based on Neem and Turmeric from W2 Life Essentials brand. I use W2 Life Essentials sunscreen during day time. Awesome review! I haven’t tried the Whamisa one, but the Krave cleanser is my HG water cleanse right now, even over the Sulwhasoo Snowise one. I thought I wouldn’t like it first because it’s difficult to get it to foam, but I got over that pretty quickly when I realized how gentle, but still thorough, it is. My skin feels so soft after I use it, and it hasn’t had any problems removing the remnants of makeup off my face when I use the Heimish balm first as a makeup remover. I get bored with products pretty quickly, but I haven’t even looked at other cleansers since I opened this one. I didn’t expect to love it as much as I do, but I’m so glad I purchased it! Hello Jude, great review. I was almost gonna buy the krave cleanser but since you mentioned it’s more for dry skin, and i have oily skin, then i think i will steer away from it. Can you recommend me a cleanser that’s suitable for morning, as well as night ? For night time, I’m already using the shu uemura porefinist oil cleanser as my first step cleanse. I would love to try the Whamisa one and for my mum to try the Krave one. I hope they become available in the UK. Hello I really appreciate the review! I was looking for someone to thoroughly explain the Krave cleanser, i just ordered it and i have dry skin so i’m glad it’s suitable for that because i have been using the glossier face wash but it doesn’t seem to cleanse well. I haven’t used the Krave cleanser yet but it seems like it won’t be good for a good thorough cleanse. I feel like I need to use a good cleanser that cleans well but doesn’t dry my skin. And so far i’ve only found cleansers that clean well but just dry my skin out. People say he cosrx good morning low ph is good but it’s too drying. Sorry it’s so long but do you have any suggestions for dry skin to cleanse well thoroughly WITHOUT overdrying and perhaps brighten ? Thank you so much!! Nice comparison !! I wanna get the matcha but it’s been sold out !! Awesome comparison ! I want to get the matcha cleanser but it’s been sold out !!! Very excited that I found the Whasima on sale at Target for $10! Perfect excuse to try it out, my sister in Canada asked me to get the Krave products for her. It will be interesting comparing notes, we have such different skin. I’m oily and she’s dry and sensitive.